The 10-minute moisture fix for skin that is dull, tight and thirsty—this hydrating face mask contains super-quenching Organic Leaf of Life extract to visibly smooth fine lines, soothe irritations and revive radiance. Hyaluronic acid locks moisture into the skin for hours of continuous hydration. Refreshing cream-gel formula enhances skin with a healthy-looking glow. *Satisfaction test on 92 women - 10 minutes after application. Gently smooth excess product onto skin, or remove with a cotton pad soaked in Toning Lotion. Rated 5 out of 5 by happycustomer from Super Hydrating! After using this face mask, my skin smelled good, felt hydrated, and very soft! Ladies and Gents with dry skin, this face mask is EVERYTHING! Rated 4 out of 5 by Eileen from Great Features Received this in multiple samples. I am ordering tonight. Leaves my my skin looking refreshed and soft. Rated 5 out of 5 by Ani C from I received this mask as a gift with my purchase and I loved it, I definitely recommend it as good as all Clarins products!!! 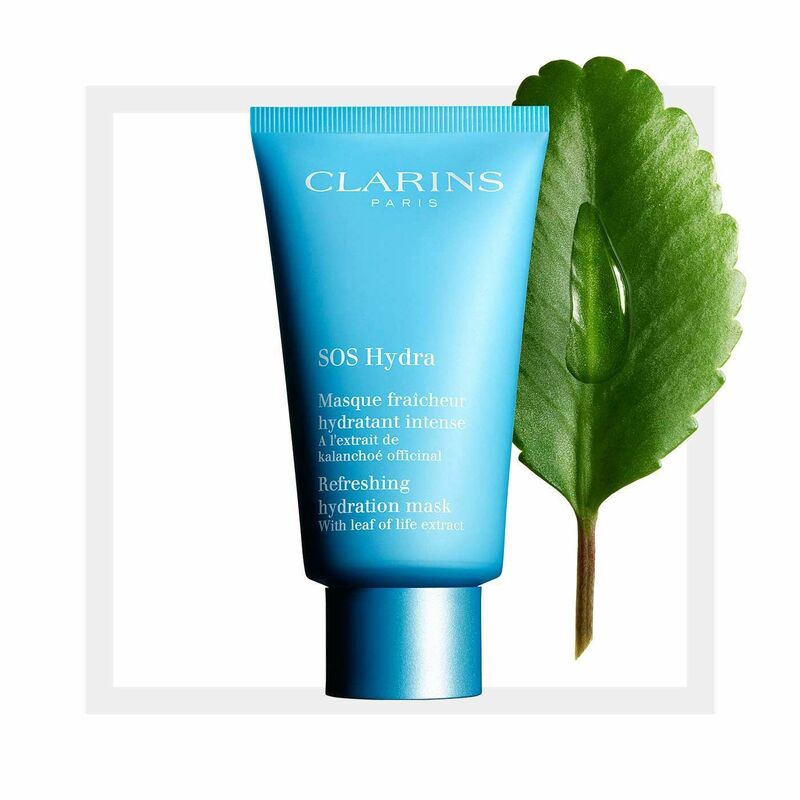 Rated 1 out of 5 by Atira979 from I really like Clarins products but not this one. I applied this mask as instructed and removed it with water after 10 minutes. My skin was mildly irritated and felt oddly dry and like it had a very thin layer of silicon on it. It was a strange feeling. I received this mask as a sample as part of a promotion and I will not be purchasing it. Rated 5 out of 5 by Elsa02 from Love it! I love everything about this mask! Leaves your skin fresh and hydrated. Rated 3 out of 5 by SharonMary from Do not like the scent I tend to have dry skin in the winter, so I thought I could use this mask overnight. Even though it moistures my skin, the scent is too strong. I can't tolerate it.